An intense seismic crisis started at Bárdarbunga volcano on 16 August 2014 and led to several short-lived smaller subaerial and subglacial eruptions, before stabilizing in an ongoing (22 Sep) fissure eruption that started 31 Aug at Holuhraun plain north of the glacier. It already now counts as the largest on Iceland in over 100 years. On this page, we try to follow the rapidly changing chain of events. Updates will be posted on top of this page. On the 27th of February Helo - Helicopter Service of Iceland reported that the flame is now out in Holuhraun. The fissure was still very active and violently erupting tall lava fountains from a number of vents when volcanologist Dr Tom Pfeiffer flew over the site on the 12the of Septmebr 2015. The large volumes of emitted magma quickly resulted in the formation of a very long lava flow (15 m) just a few weeks into the eruption. Photograph taken by Lukas Gawenda. The eruption site at Holuhraun and the immensely long lava flow and active lava field on the 26th of october 2014. Photograph taken by Ólafur Sigurjónsson. By the winter of 2014, the exposive activity had subdued and changed into effusive activity of lava flowing from a large active lava lake. Photograph from the Institure of Earth Sciences at the University of Iceland. This lava lake continued to be very active: continuous degassing gave rise to bubbles and explosions, making the lava lake look as it is boiling. Photograph from the Institure of Earth Sciences at the University of Iceland. For a TV documentary, Biwak-TV undertook a flight with helicoptercompany Norðurflug on the 22nd of February and reported that there was nearly no more active lava to be seen at the Hulhraun fissure eruption site apart from some lava spattering from a single vent. A FLIR thermal image taken on 26 February 2015 revealed that some thermal convection could still be detected at the eruptive site but that this heat is not great compared to earlier images. A SENTINEL-1 radar image from ESA 27.02.2015 showed that there had not been an increase in the extent of the Holuhraun lava field since the middle of February. Sight to the central fissure of Laki volcano, Iceland: this is what the Holuhraun eruption site will look like once life has reclaimed the area of the fissure - photograph taken by Petr Brož. No significant changes have occurred today. During an overflight this morning, no changes to the ice crevasses and cauldrons southeast of the Bárðarbunga caldera detected yesterday were seen. The crevasses were likely formed due to melting at the ice bottom, but there is no confirmation whether this had been caused by a small eruption or not, and whether such an eruption is still going on or not. "The depressions have been located southeast of the Bárðarbunga caldera, in all likelihood within the water divide of the river Jökulsá á Fjöllum. There are three circular crevasse formations, about 5 km in total length. The ice thickness in the area is 400-600 m.
The water level in Grímsvötn Lake has been surveyed and has likely risen by about 5-10 m in the last days, which corresponds to an addition of 10-30 million m3 of water in the lake. A slight increase in conductivity in Köldukvísl River was measured this morning, but the cause is yet unknown. No change has been measured in the Hágöngulón lagoon, Jökulsá River and Skjálfandi River. It is assumed, that the water from the cauldron has flowed into the Grímsvötn Lake or the river Jökulsá á Fjöllum. The seismic activity is similar to that of the last days. Around midnight, three earthquakes of magnitude around 4 were recorded and one of magnitude 5 at 08:13 this morning, all located within the Bárðarbunga caldera. 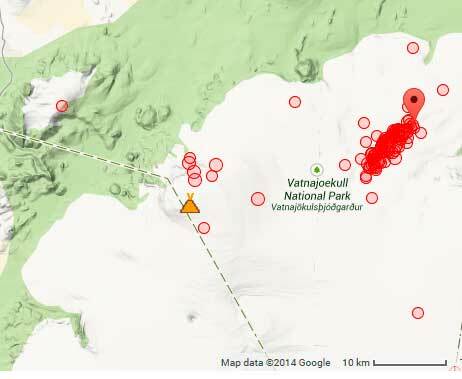 Shortly before 08:00 this morning, there was a slight increase in seismic activity in the Askja volcano. Changes in the stress field due to expansion caused by the dyke have an effect on the Askja area. Since yesterday, the length of the dyke under Dyngjujökull has increased by 1-1.5 km to the north, which is considerably less than in the last days. The dyke has now reached the fissure system of the Askja volcano and GPS measurements indicate that the area there is greatly affected." Speculations that a small eruption had occurred or still continues at the site of the new ice cauldrons continue. According to an interview with the National Broadcast (RUV), scientists estimate that 30 - 40 million cubic metres of ice have been melted. According to a statement from Civil Protection, there are 3 cauldrons, 4-6 km long, 1 km wide and approx 10-15 deep, near the southeastern rim of the Bardarbunga caldera. It is believed that they are not directly related with the ongoing intrusion now located halfway between the northern edge of the Dyngjujökull glacier and the Askja caldera. The seismic activity along the intrusion continues to propagate today, but with somewhat weaker energy compared to previous days. The surveillance airplane of the Icelandic Cost Guard will make another overflight this morning. Updated information can be expected to emerge at around 11 am Icelandic time. New cauldrons in the Vatnajokull glacier - signs of possible eruption? During an overflight today, Icelandic scientists discovered a row of 10-15 m deep ice cauldrons and many small fractures in the ice south of the Bárðarbunga caldera, forming a 6-4 km long line. The cauldrons have been formed as a result of melting, possibly a sub-glacial eruption, but it is uncertain when it occurred and whether it is still going on. The site of that activity seems to be a few km SE of the Bardarbunga caldera, where earthquakes occurred during the early stage of the seismic crisis. At the same time, earthquakes along the ongoing intrusion north of the ice cap continue to migrate northwards toward Askja volcano. IMO has not detected elevated volcanic tremor that would indicate eruptive activity. Civil Protection issued a statement that there are (at least until now) no signs of an eruption at the surface. However, an imminent eruption could not be ruled out and authorities keep a close watch on the situation. Over 800 earthquakes have occurred today so far, mostly now beyond the edge of the Dyngjujökull glacier. The crisis is showing no signs of decreasing. The intrusion itself has migrated about 1 km northwards since yesterday, and approaches the Asjka volcanic complex, which is a worrying development. A magnitude 4 earthquake occurred this morning under the eastern caldera rim of Askja (s. image). IMO does not think an eruption is imminent and announced that it will from now on only post updates once a day (around noon) unless the situation escalates. At 00:16 UTC today, a magnitude 5.3 earthquake occurred in the caldera of Bárðarbunga. At 02:50 UTC, another similar-sized earthquake (magnitude 5.2) took place in the same region. At 01:52 UTC, a magnitude 4.5 earthquake was detected on the eastern side of the Askja volcano. This was followed by a few micro-earthquakes in the same area. The dyke intrusion beneath Dyngjujökull is thought to be about 40 km in length. Modelling of GPS data indicates that about 20 million cubic metres of magma have been added to the volume of the intrusion in the last 24 hours. Modelling results suggest that the dyke intrusion is causing stress changes over a large area, including the region to the north of the dyke's extent; this could account for the increased seismicity at Askja volcano. The intense seismic crisis caused by a significant laterally migrating magma intrusion continues to evolve with little changes. Earthquake activity has been a bit weaker yesterday, only to pick up again today. Two more magnitude 5+ quakes occurred after midnight near the caldera of the Bardarbunga central volcano. The intrusion is now 45 km long and roughly 20 km deep, but so far remains mostly below 5 km depth. Horizontal spreading between the Dyngjuháls (DYNC) and Kverkfjöll (Gengissig, GSIG) GPS stations approaches 50 cm. What type of fissure eruption? A question is whether it is fed by lateral magma movement from a reservoir beneath the Bardarbunga central volcano (typical flank eruption along a fissure) or in contact with the mantle source, so it could erupt as a rifting fissure eruption, and potentially become a very large event. New magma meeting Askja volcano? The front of the propagating fissure continued to move a bit north, towards the Asjka caldera. If the current propagation rate continues, it might hit this volcano in 2-4 days. - the older silica-rich magma is heated up, can partially remelt and becomes less viscous, more able to flow. - the intruding, hot magma is cooled and dissolved gasses forced to form bubbles, causing overpressure of the system. Interestingly, the neighboring large Grimsvötn volcano located to the southeast of Bárdarbunga seems to respond to the intrusion with a weak pulsating inflation pattern (GFUM station). There are no earthquakes under it suggesting that it is caused by an own intrusion. Why this occurs is unclear. One interesting idea from VolcanCafe was "that the Bárðarbunga intrusion hit an old intrusion in Grimsvötns containing molten material and that it due to higher pressure in the Grimsvötn system took that infamous left-hand turn down Grimsvötns fissure swarm. It would certainly explain the marked pulsing on the GPS plot." According to the Icelandic Met Office, approx. 50 million cubic meters of magma have been added to the current intrusion during the past 24 hours. This corresponds to an average of approx. 500-600 cubic meters a second! Seismic activity remains high with no signs of weakening. If the intrusion breaches the surface, the most likely scenario seems to be a fissure eruption at the present location of the northern end of the dyke, i.e. immediately north of the Dyngjujökull glacier. The earthquake this morning at the north/northwestern part of the caldera at 6 km depth at 01:26 UTC could have been the biggest in the current swarm. Estimated magnitudes range from 4.1 (IMO) to 5.7 (USGS). The magma intrusion (dyke) north of Dyngjujokull is still migrating and stretches now approx. 10 km outside of the glacier. It will be interesting to see what happens when it reaches the area of the Asjka fissure swarm. A possibility could be that older dykes from that one stop the propagation of the Bardarbunga intrusion, another that it activates Askja as well. The seismic swarm continues to be intense and continues with no significant changes. A magnitude 5 quake occurred this morning 01:26 UTC northeast of the central volcano. Approx 1500 quakes had been registered during yesterday. The tip of the earthquake cluster has migrated further and is now 6-7 km north of Dyngjujökull glacier below ice-free land surface. According to IMO, there are no signs of an impending eruption as the quakes remain mostly at 5-12 km depth. The latest offical briefing from the Icelandic Met Office confirms that seismic activity continues to migrate northwards with earthquakes below Bárðarbunga becoming weaker. An eruption in the Bárdarbunga caldera is therefore at present considered to be less likely. The 10 km long tip of the dike now extends 5 km beyond the edge of the Dyngjujökull glacier. The entire dike is thought to be close to 35 km long and modelling of GPS data indicates that it contains about 300 million cubic meters of magma. - the migration of magma stops, which would be reflected in a gradual reduction of seismic activity. - the dike reaches the ice-free surface near the current northern tip of the dike and initiates volcanic activity which is expected to mainly produce an effusive lava eruption. - the dike reaches the surface where most of the fissure is beneath the Dyngjujökull glacier, resulting in an explosive, ash-producing eruption similar to the 2010 event at Eyjafjallajökull and causing floods in Jökulsá á Fjöllum. Additional GPS monitoring stations will be installed north of Vonarskarð and on Urðarháls within the next few days. The seismic crisis in Bárðarbunga and Dyngjujökull continues strongly. Today alone, more than 400 quakes of magnitudes up to 4 were detected, mostly at the N end of the active intrusion that has been going on. The location of the quakes indicating the front of the magma intrusion (dyke) continues to advance northwards. Its tip is now outside the glacier and approaching the Askja caldera. In case of an eruption, it is now more likely that at least some of it occurs on land (and not under the glacier). In total, the intrusion has a length of approx. 40 km. Horizontal displacement in the crust, based on GPS data, approaches 1 meter above the dyke. A rough estimation of the volume of intruded magma is about 1 cubic kilometers. The likelihood of a large (or even very large) rifting fissure eruption is becoming greater each day. This would occur as soon as the underground intrusions "open the lip" of the fissures on the ground and let magma to rise and decompress, producing violent lava fountaining eruptions. The Bárdarbunga volcanic system is one of the most active and productive in the world and has been the site of Iceland's largest historic eruption in 1477. Judging from current and historic data, and given that , one of the most likely scenarios at the moment would be an event similar to the fissure eruption of the so-called "Krafla Fires" at the Krafla volcano's fissure swarm during 1980-84. Even a really large event such as the 1783 Skaftár Fires (Laki eruption) cannot be ruled out (but for now has only a small chance of happening). In the meantime, Icelandic authorities have downgraded the emergency status of the area, although road closings and restrictions north of Vatnajokull are still in effect. About half an hour ago, another strong earthquake (magnitude 5.3) occurred near Bardarbunga. It is not yet listed by IMO, but was already picked up by international earthquake monitoring systems. The latest update from IMO mentions approx. 1300 earthquakes today (00-19:00) so far, mostly around the northernmost tip of the active dyke intrusion, now located 4 km north of Dyngjujökull. More than 20 quakes were above magnitude 3, and the depths of most quakes were around 5-12 km. There is currently no sign of vertical magma movement and the propagation of the intrusion has slowed down compared to yesterday. The earthquakes under the caldera are believed to be a result of magma draining from the central reservoir underneath horizontally into the new dyke. (Note: A dyke can be imagined as a fissure where magma intrudes at depth - pathways of magma inside the crust). Most Icelandic scientist now believe that no eruption occurred yesterday. The seismic activity in turn continues and has been stronger than ever today. adapted from IMO's latest status report: So far, more than 700 quakes have been recorded in the area including some of the strongest ones so far. The magma intrusion NE of Bardarbunga or under Dyngjujökull glacier has continued to propagate northwards and is now mostly under the edge of the glacier, where an earthquake of magnitude 4,2 was recorded this morning. On the chart of depth versus time, one can see that the intrusion vertically streches from approx. 20 km depth to almost the surface. If the dyke exits the ice-covered area, a fissure eruption on land is a likely scenario for the near future. - The dyke under Dyngjujökull is now estimated to be approximately 30 km long. - There are no indications that the activity is slowing down, and therefore an eruption can not be excluded. - Observations show that a sub-glacial eruption did not occur yesterday. The intense low-frequency seismic signal observed yesterday has therefore other explanations. - The Icelandic Meteorological Office has decided to move the aviation color-code from red to orange. IMO believes that the two M5 earthquakes that took place under the caldera of Bárðarbunga volcano during the night were caused by adjustments in response to pressure changes in the plumbing / magma storage system of the volcano as magma is moving. A magnitude 5.3 earthquake occurred at 5 km depth just after midnight, at 00:09. Its origin was at the northern rim of the caldera. Another earthquake, magnitude about 5, occurred at 05:33 and originated at the southern rim. These are the strongest events measured since the onset of the seismic crisis at Bárðarbunga and the strongest since 1996 (the Gjálp eruption). The magnitude is already confirmed by the European EMSC network and the GEOFON network of GFZ Potsdam in Germany. Probably, earthquakes near the Bárðarbunga caldera are a consequence of adjustment to changes in pressure because of the flow of magma from under the caldera into the dyke which stretches to Dyngjujökull, more than 25 km away. Great seismic activity is also near the intrusive dyke in Dyngjujökull. The activity is concentrated at the section which advanced northwards yesterday morning. Analysis shows that the origin of the quakes, there, has migrated a little towards north. Their depth is mainly in the range of 8-13 km. The largest earthquake in the Dyngjujökull area was 3.5 at 04:39. No signs of tremor, indicative of eruption, were detected during the night." The seismic crisis continues to evolve rapidly. Whether an eruption occurred or not yesterday remains uncertain, but seismic activity is intense, and the likelihood of a more significant eruption increases with each day. The latest earthquakes have occurred again both directly under the central volcano's caldera and along the now northwards propagating fissure 20-25 km to the NE of it, suggesting that most magma continues to migrate laterally rather than arriving at the surface. Since yesterday, the N-S dike has increased by approx. 5 km length. - Tremor has jumped up again. - Deformation as seen on GPS data plots continues as rifting intrusions in the crust make space. - The magnitude 5.3 earthquake at 00:09 local time was the largest event so far in the current crisis. It was felt all over the country. - Air space a large radius around the volcano is now closed. Tremor has dropped again. A magnitude 5.3 earthquake occurred shortly after midnight at 10 km depth. There are no clear signs telling whether eruptive activity is still (or had all all been) going on. IMO writes "Presently there are no signs of ongoing volcanic activity. The aviation color code for the Bárðarbunga volcano remains red as an imminent eruption can not be excluded." First images of the eruption ? The eruption is becoming visible on webcam images showing a plume of gas, steam and dilute ash rising from what could be fissures no the ice cap. How likely will the new eruption affect air traffic? Even if Bárðarbunga's eruption continues and breaks the ice, allowing explosions between magma and water/ice to eject significant amounts of ash, most experts agree that a scenario like the Eyjafjallajökull back in 2010 is unlikely to repeat itself. Back then, most of Europe's airspace was closed for 6 days, which caused 100,000 flight cancellations and left thousands of travelers stranded all over the world. Back in 2010, airlines had a policy of "no ash" policy, i.e. any amount of ash in the air was to be avoided. Following research into the subject of how large ash concentrations need to be to actually cause damage, most airlines today have set a more tolerant limit which would allow them to fly through very dilutes ash plumes nevertheless. Now, a limit of 4,000 micrograms of ash per cubic meter is accepted. That will result in significantly fewer cancellations even if an ash plume again spreads over Europe. The Grímsvötn volcano eruption in 2011, which was significantly larger than Eyjafjallajökull, but also shorter, proved this. Only 900 flights were cancelled then. In addition, meteorological conditions in 2010 were such that the ash was transported directly over northern and central Europe, something that is not likely to repeat exactly as such. Third, the 2010 eruption lasted exceptionally long and produced a significant amount of the very fine ash that actually can be transported over long distances. In other words, the 2010 eruption had all right ingredients for a large-scale air-space closure, which are unlikely to be repeated all at once again. So far, the eruption is thought to be small, and remains under the ice. However, it could rapidly become a bigger event. Intense internet traffic seems to overload the servers of the few available webcams. The eruption has started today under the Vatnajökull glacier, the Icelandic Met Office wrote in a brief update. An reconnaissance flight by the Icelandic Coast Guard detected an ongoing lava eruption under the Dyngjujökull glacier using radar data. So far, the eruption seems to be small and has not breached the glacier's 150-400 m thick ice. No signs were seen at its surface during the flight. The aviation color code for the Bárðarbunga volcano has been raised to red. Some minutes ago (14:04 local time), one of the largest quakes, estimated magnitude 4.5 occurred. More information is expected to be published later today. The magma intrusion northeast of the central volcano developed a N-S trending path today, marked by earthquakes between 20 and 2.5 km depth. If this corresponds to a deep-reaching fissure system where magma could rise directly from the deeper mantle source, chances are that what seems to be an impending eruption could be large. Its most likely location would currently be approx 13 km east of Kistufell under the glacial ice. An eruption would generate significant meltwater flooding and ash emissions, as soon as it breaks through the ice cap and explosive interaction of magma and water is exposed to the atmosphere. The situation remains to be followed closely. After a phase of weakened activity, the intrusion gained strength this morning. According to data from IMO, the dyke progressed approx 5 km in just 6 hours, i.e. at an average speed of 0.23 meters / second. Even higher progression rates have been recorded during past eruptions, most notably the rift eruption at Krafla to the north in 1975-1984, when top speeds of magma intrusion progression reached approx 1 meter per second. Seismic stations near the volcano show a marked increase in tremor since about an hour ago. This could indicate that an eruption has started or is about to start, but this needs to be confirmed. Th first visual signs of an eruption should be meltwater floods. Earthquakes at Bardarbunga volcano so far today. The pointer is the epicenter of the magnitude 4 quake this morning. The earthquake swarm continues with no signs of stopping in two areas: below the caldera and under the NE-SW aligned rifting area approx. 20 km to the NE of the volcano. Earthquakes seem gradually becoming larger, in particular those under the caldera. This could be caused by weight adjustments as magma shifts underground, or it could indicate new intrusions at this place. The strong earthquake swarm that had started 16 Aug continues. So far, more than (mostly small) 5000 earthquakes of magnitudes between 0-4 have been registered. According to Icelandic scientists, the swarm is the result of magma intruding into a 25 km long fissure system in the crust under the Dyngjujökull glacier at 5-10 km depth. At the moment, there are no indications that magma is moving towards the surface, which would mean an eruption, but rather continues to move horizontally along the fissure system, possibly branching at the northeast end of the dyke. 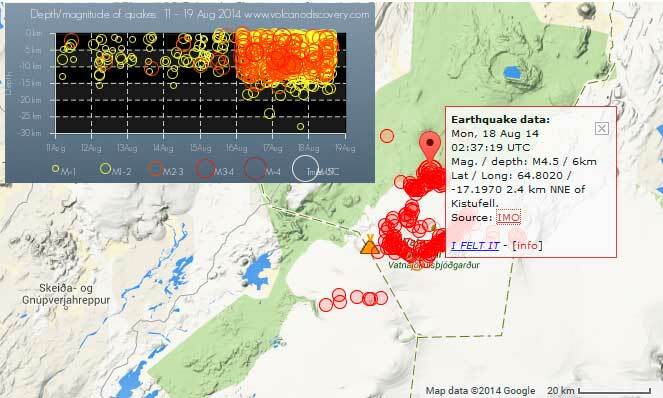 One earthquake of magnitude 4.7 was measured in the Bárðarbunga caldera at 4 km depth 21 Aug evening at 23:50. This large event was at similar location as earthquakes of magnitude larger than 3 that were seen that day. Large events in Bárðarbunga are interpreted as adjustments of the caldera rim related to decompression in the caldera since the beginning of the unrest. The activity continues and an eruption can therefore not be ruled out. There are no signs of increased conductivity through geothermal activity into the rivers. From the beginning of the activity, GPS measurements have shown displacements on the surface of over 14 cm, 15 - 20 km from Dyngjuháls. In comparison, Iceland on the whole is spreading at the rate of about 2 cm pr. year. In other words, the events so far reflect rifting equivalent to approx. 7 years average. The intense earthquake swarm continues with no significant changes. There are no signs of magma migrating towards or reaching the surface are present, although the risk of a subglacial eruption in the near future remains high. This could lead to significant glacial floods and ash emissions, which in turn could cause again disruptions of flight operations in the region, depending on the wind trajectories and the amount of ash released. A slow migration of the quakes towards the NE is visible during the past days, indicating that the intruding magma at shallow depth is currently moving horizontally. "No sign of harmonic (volcanic) tremor detected. The earthquake swarm that began on 16 August at 03:00 is still ongoing. Intense earthquake activity is concentrated in the region between Bárðarbunga and Kverkfjöll calderas. The swarm continues to migrate towards the NE, however at a slower rate than in the last days. The swarm north of Bárðarbunga caldera (at the edge of Dyngjujökull just E of Kistufell) has diminished. There have been some earthquakes within the Bárðarbunga caldera. Throughout the whole sequence until now, the majority of seismic events have been calculated to be at 5-10 km depth. There is no sign of upward migration. The event rate is still high. ~4000 events have been automatically detected since the beginning of the swarm on Saturday morning, ~700 since midnight today. Activity ebbs and flows in pulses of several hours lengths. The last pulse of high activity rate started at 9:30 this morning and is still continuing. All events since Monday morning have been magnitude 3.0 and less. The results of continuous GPS measurements continue to indicate magma intruding within the Bárðarbunga volcanic system. During the period between 8 am on the 15th of August and 4 pm on the 18th of August a GPS station on Dyngjuháls moved 5,4 cm towards the northwest and a GPS station on Grímsfjall moved 1,8 cm towards the south. Models suggest that the most likely explanation for the movements of the GPS stations is that there is an ongoing dyke intrusion east of Bárðarbunga. There have been no observations of migration towards the surface or any other signs of imminent or ongoing volcanic activity. We cannot exclude that the current activity will result in an explosive subglacial eruption, leading to an outburst flood (jökulhlaup) and ash emission." An eruption of the subglacial volcano seems more and more likely to be imminent. Rapid inflation suggests magma intrusion at shallow depth. Orange alert has been declared today by the Iceland Met Office (IMO). The earthquake swarm continues intense with so far approx. 2000 earthquakes detected, including about 200 of magnitude 2 and higher. A magnitude 4.5 event occurred this morning NE of the volcano at 6 km depth. The epicenter locations have migrated from their original cluster location east of the volcano to an elongated area to the NE of the volcano. This would likely be the area a new eruption could start.